Çatalhöyük in southern Turkey has been called the world’s oldest known city. The site consists of a town of many buildings that appears to have flourished between 8000 and 10000 years ago. Some of the buildings have surviving wall paintings, and it is one of these that is reproduced above. The orange, spotted object in the picture has since the 1960s been widely seen as the oldest surviving artistic representation of an erupting volcano. This brings one to the spots on the mountain, the objects spurting out of the right-hand top, the ‘cloud’ of dots and strokes above (and to the right) of it and the lines extending from the base of the mountain. All these can be interpreted as the usual phenomena of a volcanic eruption: the rain of glowing volcanic bombs and red-hot rocks; the cloud of glowing particles above it and perhaps tongues of lava welling up from vents near the base of the mountain. It is known that the Central Anatolian volcanoes were active until the second millennium B.C. An ‘eye-witness’ painting of an early seventh millennium eruption of Hasan Dag is therefore certainly a possibility and in view of its economic importance a highly relevant subject to be recorded in a shrine. The reference to the ‘economic importance’ of Hasan Dagi is an allusion to its role as the source of the obsidian that was traded by the inhabitants of Çatalhöyük. The interpretation of this wall painting as a map showing the town and the erupting volcano has proved irresistible to archaeologists, historians of cartography, art historians, scholars of urban history and, not least, volcanologists. The picture is ‘a remarkable Neolithic portrayal of an active volcano, the earliest known visual record of a volcanic eruption’ says archaeologist Stephen L. Harris in the Encyclopedia of Volcanoes (1999), where it is also noted that the volcano appears to be ‘exhibiting only mild Strombolian activity’ (p. 1308). 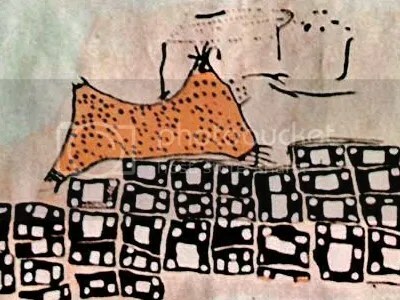 In the same work, volcanologist Haraldur Sigurdsson writes (p. 1319) of the Çatalhöyük image as the ‘earliest visual representation of volcanic eruption … it is very likely that this ancient painting represents an eruption of Hasan Dag’. The picture has been cited in modern volcanological works as evidence for the volcanic prehistory of the region, as in A. Karakhian et al, ‘Holocene-historical volcanism and active faults as natural risk factors for Armenia and adjacent countries’, Journal of Volcanology and Geothermal Research (2002) and A. Umran Dogan et al, ‘An isobaric–isenthalpic magma mixing model for the Hasan Dagi volcano, Central Anatolia, Turkey’, Bulletin of Volcanology (2008), and as an example of the socio-cultural importance of volcanoes through human history, as in Michael H. Ort et al, ‘Variable effects of cinder-cone eruptions on prehistoric agrarian human populations in the American southwest’, Journal of Volcanology and Geothermal Research (2008). However, it seems that the ‘map’ of Çatalhöyük is no map and the ‘volcano’ is no volcano, according to an article by Cambridge archaeologist Stephanie Meece, ‘A bird’s eye view – of a leopard’s spots: the Çatalhöyük “map” and the development of cartographic representation in prehistory’, published in Anatolian Studies in 2006 (and available in full text from this link). Meece argues that the spotted orange shape interpreted by Melaart as a volcano is in fact a leopard skin, and that the chequered pattern in which he saw a plan of the town is just a chequered pattern. Leopards and leopard skins are both common decorative motifs at Çatalhöyük and at other Anatolian Neolithic sites, as are chequered patterns of this type. John Krygier discusses Çatalhöyük and Meece’s article, with many illustrations and references, at the Making Maps blog. He suggests the history of the Çatalhöyük ‘map’ is an example of cartocacoethes, ‘a mania, uncontrollable urge, compulsion or itch to see maps everywhere’. In the light of Meece’s arguments the ‘volcano’ does look rather more like a leopard skin than it looks like Hasan Dag, which does not resemble the shape shown in the painting when viewed from Çatalhöyük and which was not the source of the obsidian used at this site, or indeed any ancient site yet identified, anyway. Mellaart himself believed initially that the orange shape in the picture was a leopard skin, and it was only later that he became convinced that he was looking at the earliest known picture of an erupting volcano, vibrantly and accurately depicted by the inhabitants of Çatalhöyük as a means of honouring the powerful natural force that loomed over their town and gave them their wealth in the form of obsidian. A. Karakhanian, R. Djrbashian, V. Trifonov, H. Philip, S. Arakelian, A. Avagian, ‘Holocene-historical volcanism and active faults as natural risk factors for Armenia and adjacent countries’, Journal of Volcanology and Geothermal Research, vol. 113, nos 1-2 (2002), pp. 319-344. Stephanie Meece, ‘A bird’s-eye view – of a leopard’s spots: the Çatalhöyük “map” and the development of cartographic representation in prehistory’, Anatolian Studies, vol. 56 (2006), pp. 1-16 (link to full text available here). James Mellaart, ‘Excavations at Çatal Hüyük, third preliminary report’, Anatolian Studies,vol. 14 (1964), pp. 39-120. James Mellaart, Çatal Hüyük:A Neolithic Town in Anatolia (London: Thames & Hudson, 1967). Michael H. Ort, Mark D. Elson, Kirk C. Anderson, Wendell A. Duffield, Terry L. Samples, ‘Variable effects of cinder-cone eruptions on prehistoric agrarian human populations in the American southwest’, Journal of Volcanology and Geothermal Research, vol. 176, no. 3 (2008), pp. 363-376. Haraldur Sigurdsson, Bruce Houghton, Steven R. McNutt, Hazel Rymer, John Stix (eds. ), Encyclopedia of Volcanoes (San Diego, CA: Academic Press, 1999). A. Umran Dogan, Meral Dogan, Attila Kilinc, Darren Locke, ‘An isobaric–isenthalpic magma mixing model for the Hasan Dagi volcano, Central Anatolia, Turkey’, Bulletin of Volcanology, vol. 70, no. 7 (2008), pp. 797-804. Where is this map housed? It’s a wall painting, and my assumption is that it is still in place at Çatalhöyük, but I’m open to correction on that point. It is a painting in natural earth pigments (ochres, etc) made on a mud brick wall which was first prepared with many layers of lime plaster. Mellaart separated the layers of plaster from the wall behind them, in three sections (the painting extends around a corner onto another wall) and these were taken to the Museum of Anatolian Civilizations in Ankara in the 1960’s, where they are on permanent display along with other wall paintings and some Çatalhöyük artifacts from the 1960’s Mellaart excavations. Artifacts from the current excavations have tended to be kept in the musuem in Konya, not far from the site, and there is a small museum (mainly containing reproductions) at the site itself, which welcomes visitors. Thanks to Stephanie Meece for paying us a visit, and for providing that information.